The Ironclad Triple Threat TPT553-MD basketball system is the best combination of durability and affordability of any of the Ironclad adjustable goals. This unit fits any driveway or downsized backyard court perfectly. It's 54" wide backboard is wide enough to accommodate any angle bank shot. 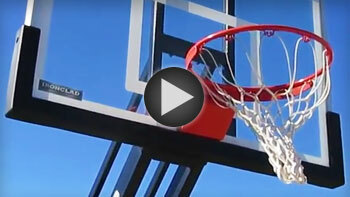 The heavy duty H-Frame backboard support eliminates risk of backboard breakage from hanging on the rim. And don't forget, the backboard is made using 1/2" thick tempered glass, same thickness used in NCAA and NBA backboards for true bounce. The easy to reach crank handle is accessible to any age child or adult. The spring assisted crank design means the goal will be easy for even a 5 year old to quickly crank up or down. Backboard height can be lowered anywhere from regulation 10' down to 5', low enough for any child able to hold a basketball! Backboard, pole and gusset pads are included free. And unlike competitors, Ironclad offers free anti-rust WeatherSheild protection pretreated on steel structure to prevent rust. As with all Ironclad products, you can rest easy knowing your purchase in covered by Ironclad's Lifetime Limited Warranty covering all components of the goal system. So if you are in the market for a unit that won't overwhelm your driveway, get the unit with the most bang for your buck, TPT553-MD. Easy Adjustment: Adjustable from 10' down to 5' with easy to reach crank handle. Spring Assist: A spring loaded compression cylinder is mounted to the back of the unit to make cranking the backboard upward as easy as it is to crank downward. Two compression springs are contained inside a steel cylinder which pull downward assisting the crank actuator during adjustment. The spring assist cylinder also increases the strength and longevity of the crank mechanism. Thick Glass Backboard: 1/2" thick glass, 36" tall x 54" wide. 36" Offset from Backboard to Post: Helps avoid player contact with the post during layups and low post moves. Heavy Duty Post: 5”x5” x 7 gauge square one piece pole is extra rigid even under slam dunk action. The 7 gauge post is 50% thicker than posts commonly found at the large sporting goods outlets. Heavy Duty Flex Rim & Net: Gymnasium quality flex goal and net. Double spring return ensures weatherproof reliable rim return function with classic ram horn net attachment design which prevents premature net wear. Bolt-down Installation: Installation is easy with bolt-down post design. Allows easy pole leveling and relocation if you move. Eight welded support gussets provide superior post to baseplate stability. WeatherShield anti-rust undercoat: All steel components are dipped in a zinc bath galvanizing the parts against rust prior to powder coat paint. Stainless Steel Assembly Bolts: All assembly bolts are made from stainless steel to prevent rusting bolts common with competitors models commonly found at large sporting goods chain stores. Best basketball hoop available. I did about six hours of research and found this brand to be the best. It actually goes down to 5 feet which many others don’t, and my kids and their friends love to dunk and hang on it. I have played basketball all my life and this feels like an indoor quality basketball hoop. I even dunk and hang on it with no issues. Much better quality than Pro Dunk when you look at the little details. Atomic Sports was great in answering all my questions and delivering a quality product as promised. I have had multiple neighbors and friend come over just to look at it and compliment. Great product, won’t regret it. Surprised it was so easy to put up, stainless hardware included separated this goal from the rest. Easy to install, stainless hardware great inclusion and its sturdy as a rock! We are loving our new Triple Threat basketball goal. The shipping was fast and everything arrived in perfect condition. The goal seems solid and very well made. I love that the hoop lowers to 5’, so that even my 4 year old can join in on the fun. When comparing to other similar systems, the Ironclad goals seemed to offer a better make for a much better price than the competition. Backboard Size: 32" x 54"